THE TAOISEACH HAS welcomed Japan’s decision to reopen its market to Irish beef. Irish farmers will now be able to send their produce to the island nation for the first time since 2001. The announcement was made during Enda Kenny’s trade mission to the Pacific Ocean country. He is being accompanied by Agriculture Minister Simon Coveney and the pair met with Prime Minister Shinzo Abe in Tokyo over the weekend. Bord Bia estimates that the short-to-medium-term opportunity for Irish beef in Japan is worth between €12 and €15 million, with potential for significant expansion beyond that over time. Coveney said that the decision to allow access for Irish beef to Japan was “very significant” and reflected confidence in the integrity of Irish food systems. “Japan is a sophisticated market with sophisticated consumer, who are seeking beef product which Ireland can provide. Japan also sets a benchmark for food safety standards, and for that reason access for Irish beef is very significant from a reputational point of view,” he added. Talks to overturn the 12-year-ban had been ongoing between the two governments since 2011. Meanwhile, the Irish Cattle and Sheep Farmers’ Association has warned that all is not well in the beef sector. According to the beef chairman at the organisation, there is an emerging crisis of confidence linked to difficulties in getting young bulls slaughtered. “The focus of the anger is not just about the fact that beef price is showing no signs of improvement, it is about the apparent lack of interest in cattle,” said Edmond Phelan. “Finishers who have specialised in young bulls are getting the signal that they are not wanted but this poses a real problem for quality cattle coming from the suckler herd. “The meat industry has been messing around for a while now saying that they want young bulls slaughtered at under 16 months,” he continued. “The reality is that heavy continental weanlings cannot be economically finished at that age given the cost of feed inputs on Irish farms and allowing for the fact that our strength is growing grass. He added that any talk of increased output under the Food Harvest 2020 initiative is “very foolish”. Email “Japan ends 12-year-ban and reopens its market to Irish beef ”. 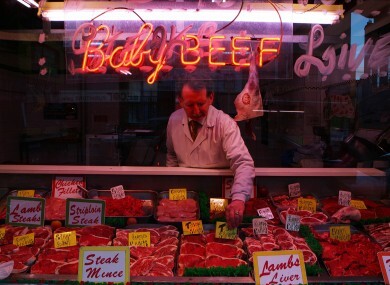 Feedback on “Japan ends 12-year-ban and reopens its market to Irish beef ”.